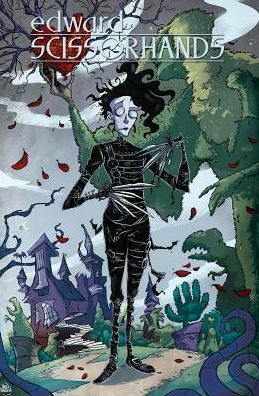 I saw Edward Scissorhands in its original run in the theaters in 1990 (I don’t know why I thought it was released a few years earlier than that). I like it well enough, but it was never one of my favorites. Maybe that’s because the ending is so bittersweet. 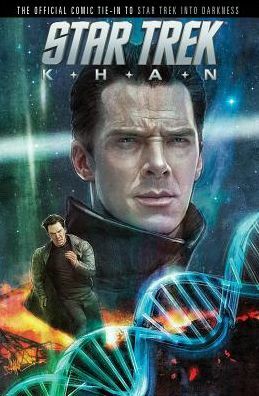 It certainly is a cult classic, though, so it makes sense that someone decided to extend the story…in this case, through graphic novel format. This is the first volume of combined individual issues that, I believe, started releasing last fall. THE PLOT: Megs has always believed in her grandmother Kim’s stories about the man everyone else believes is a murderer. Megs’s mother believes her own mother was deranged, and they were not on good terms when Kim passed away. Megs is obsessed with finding Edward, despite her mother’s nagging that she forget him AND her grandmother. At the same time, Edward, alone in his mansion, finds an earlier prototype with some missing parts, whom he activates and names Eli. Eli becomes the same sort of monster everyone believes Edward is. Together, Megs and Edward work to track down Eli and clear Edward’s name. MY TWO CENTS: The art is colorful, but the style is not to my taste. Everyone is drawn to look very unattractive in a cartoony way, which may be deliberate. Megs is definitely not the pretty popular girl her grandmother was. That’s okay (she reminds me a bit of Amy Farrah Fowler), but she is also drawn to look a bit abrasive. The story is engaging, but why does all the action start at this moment in time? Is it because Kim has just died, which makes both Edward and Megs lonelier than ever? With their one link gone, all that remains is for Megs and Edward to connect with each other. Their relationship does seem to be more about friendship than romance at this point…which is also just fine. BOTTOM LINE: An interesting continuation of a classic movie, definitely worth checking out for dedicated fans. I’m interested in reading the next volume. 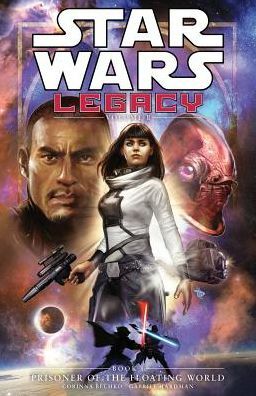 I don’t read many comics or graphic novels (manga excepted), but I did read most of the first “Star Wars Legacy” series. I was excited to hear that Dark Horse was doing “Star Wars: Legacy II” featuring a female protagonist. I believe this bind-up is volumes 1 through 3 of a planned 18-volume arc; as many have probably heard by now, by 2015 Star Wars comics will be moving from Dark Horse back to Marvel. THE PLOT: I think this picks up not long after Legacy I ended, with some of the same characters. For example, Marisiah Fel is empress in the triumvirate government. However, most of the action takes place in a junkyard with Ania Solo and her sidekick, the Mon Calamari Sauk. They find a lightsaber, which is actually symptom of a bigger problem with imperial knights, a communications array, and (surprise!) Sith. MY TWO CENTS: My problem with Legacy I is that I never really liked Cade Skywalker. His character just didn’t appeal to me, and I felt like he was drawn as a cruel distortion of Luke (which, I suppose, was partially the point). In any case, I do feel more sympathetic to Ania. She seems like a tough, spunky girl who is worthy to be a descendent of Han Solo and Princess Leia. The question is: where does she fit in the family tree? She’s supposed to be a great-great-granddaughter, which means either a granddaughter of Allana or of Jaina’s child(ren). Ania does, apparently, realize that she’s part of the Fel family, but doesn’t associate with them. Her question of “Do I look like royalty?” is met with the response, “Han Solo wasn’t royalty. He was a smuggler.” But it seems that the ruling Fels aren’t aware of Ania’s existence, based on Sia’s exclamation at the end: “Who the HELL is Ania Solo?? ?” Indeed. THE BOTTOM LINE: The art is interesting and colorful, Ania is engaging, and I’m willing to go along for a while to find out more about future Solos…especially outcast ones. TEACUP RATING: I’m giving this about three-and-a-half to three-and-three-quarters cups. It seems to be a promising beginning. Note: Review is based on an ARC provided by the publisher via NetGalley in exchange for an honest review. However, I was interested enough that I bought a copy for my Kindle Fire. Did you know that in Kindle Fire you can isolate and zoom individual comic panes? It’s kind of awesome!